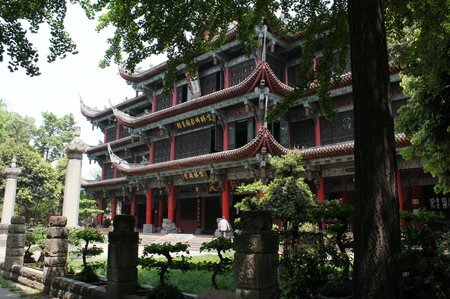 You have to like a city where one of the major tourist attractions is called the “Wuhou Temple”. Chengdu is the capital of Sichuan province in central China, you’ve probably heard of it because of its’ native pandas. Damn pandas. Our hostel ran trips to see the oversized sleepy bears from 7:30am to Noon most days. A fine idea – to catch the pandas in the few hours when they are awake – but it meant that when we arrived, tired from our over-night train journey hoping to nap for a few hours, our room wasn’t ready – i.e. the current occupants had not yet checked out. When they still hadn’t checked out by 10am, I was sure they were off oohing and aahing at pandas. Damn pandas. We sloped off in search of somewhere quiet to relax – not an easy thing to find in a city of over 11 million people but we were lucky. It was just a few minutes walk to the Wenshu Yuan temple area. We found a charming little teahouse and sunned ourselves in the courtyard. Since we were only going to be in Chengdu for a couple of days (we were passing through on our way to hike in Western Sichuan), it seemed wrong not to at least walk through the temple area to check it out. The temple buildings did not disappoint. The building above is a large library at the back of the complex which is walled and includes a serene garden (if you can block out the sound of the locals hocking and spitting). The garden gave reprieve from the smell of incense which can be overpowering in such temples. Our kids have no tolerance for what I consider a soothing and relaxing smell. We spent more time in the garden than the actual temple, but that’s OK – we’re all almost at our lifetime quota of Buddhist and Confucian temples. There is a small pond in the center of the garden with, as you’d expect in any self-respecting Chinese garden, small bridges over the pond. When crossing over one of these, BigB yelped out in surprise. I thought he’d hurt himself but no, he was just reacting to the sight of turtles scrabbling over each other trying to get the best position in the sun. 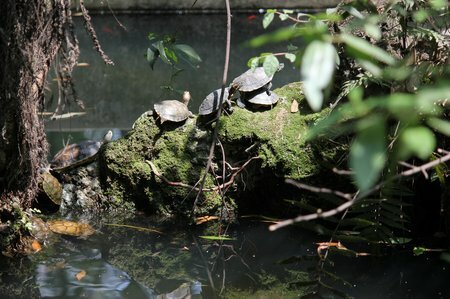 There were turtles on every tree branch and root jutting out of the water. We stood fascinated for quite a while before ambling off in search of a bed and a nap. 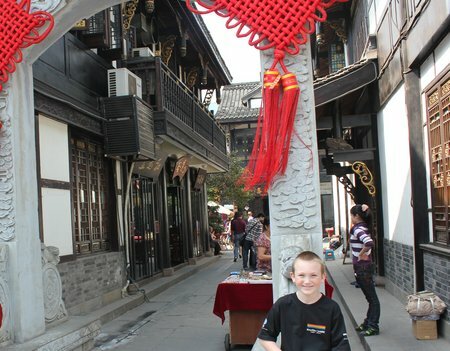 This entry was posted in China, International Escapades and tagged Chengdu, China, China With Kids on May 15, 2011 by wandermom. Chengdu is my favorite city in China. Love the food, people, pandas and so much more. Am hoping to take my daughter next year. I was went to Chengdu twice.I love everything there.